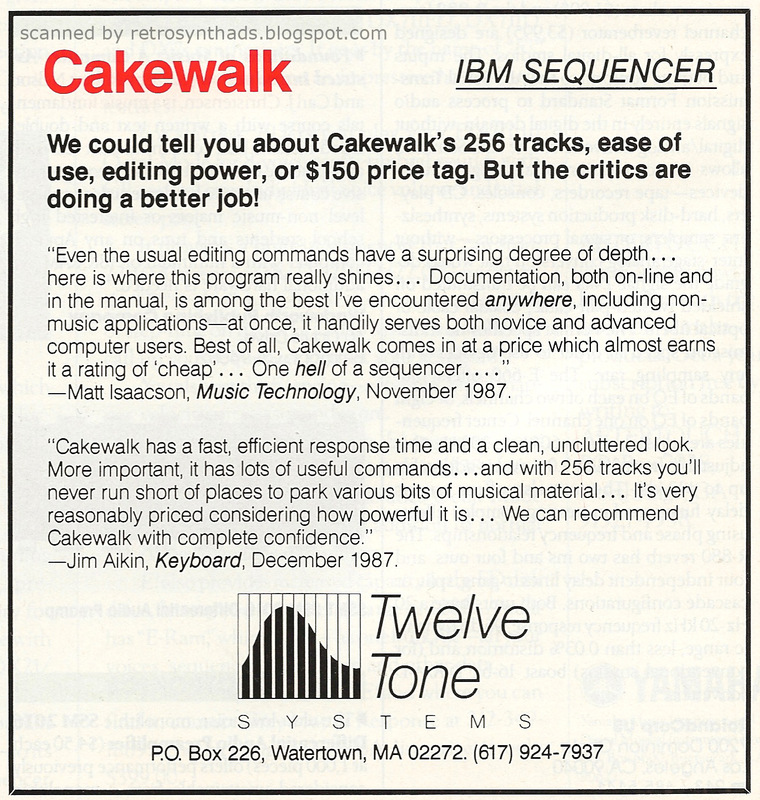 Twelve Tone Systems' Cakewalk "IBM Sequencer" 1/3-page colour advertisement from the bottom right corner of page 13 in the March 1988 issue of Electronic Musician. Note: This is Twelve Tone Systems' third advertisement. I've blogged about their first ad and second ad as well. Not essential reading to follow along, but part of the fun ride. This third Cakewalk ad ended up running in the January, March, April and May 1988 issues of Electronic Musician. The only colour in this ad is the word "Cakewalk" itself - and even then, the ad only got the colour treatment in the March issue. In all the other issues, the ad is fully black & white. Looking at the rest of the page of that March issue, there are red sub-headings for the "letters to the editor" article that appears there, so I guess Twelve Tone had the option to include some colour in their ad and they took the opportunity when presented. Considering this is the first time the logo has appeared in advertising material, I found it interesting that they chose the word "Cakewalk" to be red. One thought is that it could have been easier to colourize the word Cakewalk as its just text. 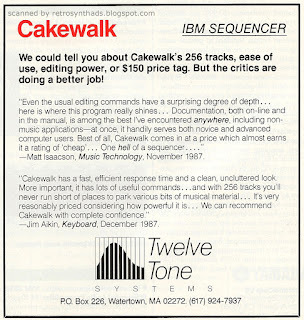 Also, from that earlier interview with Twelve Tone Systems' founder that I referenced in the blog post for their first ad, it was clear that people were already referring to the company as Cakewalk (and why they later changed the name of the company to Cakewalk). The ad-copy in this third ad takes a different approach than their previous two. In the first two ads, the company focused on relaying Cakewalk's main features to the reader - 256 tracks, ease of use, editing power and low price. But this time, they quickly got their speaking points out in bold lettering in the first paragraph, and then used the majority of the ad space to promote themselves through quotes from recent product reviews conducted by relatively well-known authors - Matt Isaacson from Music Technology Magazine and the one and only Jim Aikin from Keyboard. Letting the industry professionals do the talking is always a good strategy, as long as there is no disconnect between the statements made in the ad and those found in those VERY recent reviews. You never want to be called out for taking a someone's words out of context to benefit your product. Well, you can guess what happened next - time to hunt down those original reviews. Up first was the Cakewalk review in the November 1987 issue of Music Technology. An awesome issue that also includes great interviews with Kitaro and fellow Canadian Daniel Lanois. But, I resisted the urge to let myself get distracted and start flipping through the magazine. I went straight to page 75 to read the review. "For every problem technology solves, it creates another. The main problem which Cakewalk poses for me is how to do it justice in the limited space allotted for the review." It continues to spell out the specs of the software and what is required to run it. Looking back at reviews thrity years later is great because you read it from a totally different perspective. According to the review, it supports colour monitors and Microsoft Mouse, but is quite usable in the absence of both. What? You could use a mouse with Microsoft DOS? I don't recall this *at all*. Anyways, the three and half page review continues on, first with a basic "Getting Around" section. This includes among other things explanations on the pull-down menu, keyboard short cuts, and online help. The next section, an extension of the first really is "Looking Around", describing the main window itself. With those basics out of the way, Matt then digs in deep with a section called the "The Sequence View Window", where he describes the Track, Measures and Event views. Most if not all the work is done on one of these three screens. The last two sections of the review are "Recording" and, quite easily the largest section "Editing". Before we get to the conclusion, there is a sticky little section called "Problems". Matt basically came up with four issues. The first was that playback timing of some tracks became "askew" after recording. The second and third issue were basically software bugs - one that could affect event editing and another that affected the MIDI start command under certain conditions. Not too shabby for version 1.1 software of anything. The final problem Matt identified was the software's total disregard for system exclusive messages. His conclusion more than made up for pointing out these faults in the software, with Matt calling Cakewalk "one hell of a sequencer", who's "editing capabilities are too good to ignore". Nothing taken out of context here. I next looked up Jim Aiken's review in the December 1987 issue of Keyboard. At only two pages, it might seem that its not as in-depth as the previous review, but Keyboard's small font size and single line spacing probably more than makes up for this difference. Jim's review starts even more positively than Matt's. "Standards in sequencer design are pretty high these days, but software newcomer Twelve Tone Systems scores quite well with Cakewalk, a full-functional sequencer program for the IBM PC." And, just like Matt, he too points out in his introduction that you can use Cakewalk easily with or without a mouse. Interestingly, unlike the review in MT that leaves the messy list of issues and bugs until the end, Jim likes to point these out within the sections themselves. For example, in the introduction he point out one of Cakewalk's faults right at the get-go - no automated punch-in. Two different review styles - both legit. Although I prefer the first so all the problems are featured in one place. Like Music Technology's review, after the introduction we get an in-depth overview of the software and its main screens - navigation and the Track, Measure and Events view. While the MT review didn't seem to mind the Measures view, Jim described it as looking "vaguely like the main screen on the Roland MPS/Mesa sequencer, and is probably just about as useless...". The next section of the review focused on editing, detailing some of the more complicated (in a good way!) aspects of the software. He does point out they found a serious bug in the event filter that would crash Cakewalk, but also offered up a work-around. The final section before the conclusion is called "Utilities", which points out some of the "miscellaneous goodies in Cakewalk", which included storing of tempo settings, the ability to run a second program without dumping Cakewalk from memory, some of Cakewalk's save features including it's autosave, and the filtering of incoming MIDI data. One feature he called "unusual" and "could be real lifesaver" was that incoming data that was on separate channels could be kept separated on different tracks in Cakewalk. Dang! The things we take for granted now. "Greg Hendershott appears to have done a thorough and effective job, and we can recommend Cakewalk with complete confidence. There are several good IBM sequencers around, but if you're shopping for one, we'd definitely suggest that you get an in-store demo of Cakewalk so you can make an informed decision". So, as you can see, within the space of eight months Twelve Tone Systems' had managed to launch a product in April 1987, advertise effectively and get two very positive reviews in at least two large and influential industry magazines by the Christmas season. 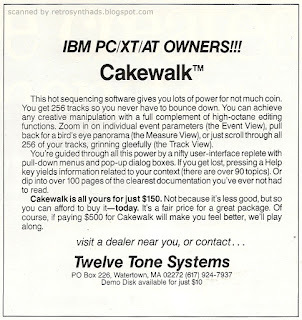 Twelve Tone Systems' Cakewalk sequencer software "IBM PC/XT/AT OWNERS!!!" 1/4-page black and white advertisement from the top-right corner of page 13 in the August 1987 issue of Electronic Musician. Hey there! This is blog post #2 of my walk down Cakewalk memory lane. If you haven't read the first one... you may want to do that now. Or don't. If you recall from my previous post, Twelve Tone Systems' first advertisement (right) had run from April through June 1987. If you had picked up that July issue and noticed it missing, you might have thought that was the end of Cakewalk. But, as you are no doubt aware, it definitely wasn't. And after a brief one month hiatus, this second Cakewalk ad appeared in the August issue and continued to run for four consecutive months through to November 1987. From that first small advertisement's humble beginnings, Twelve Tone Systems began picking up users a few at a time. But that costs money and a new product can always use a bit of earned media (in other words, free) to help get their legs running in the right direction. 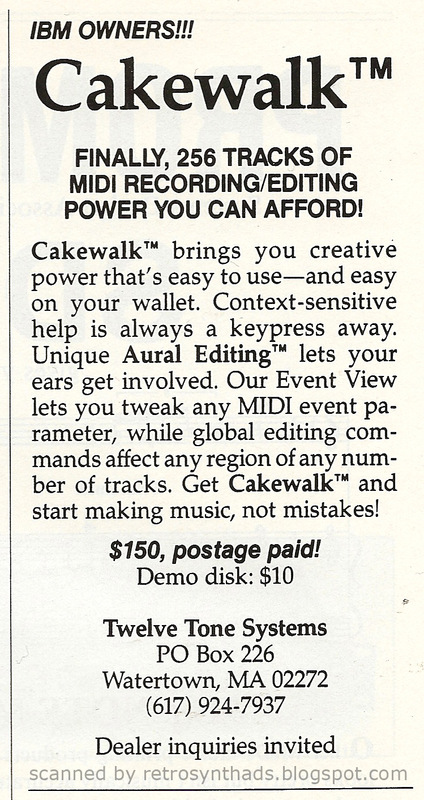 "Cakewalk ($150.00), a MIDI recorder/editor for the IBM PC/XT/AT (256K memory and Roland MPU-401 required), features 256 tracks of unlimited length, a pull-down menu interface, a detailed Event View for editing MIDI parameters, and extensive global editing commands. Edit regions can be marked by ear and further refined using Event Filter criteria. A demo disk is available for $10. Twelve Tone Systems. PO Box 226, Watertown, MA, 02272 617/924-7937." "Cakewalk MIDI recorder/editor. Twelve Tone Systems' Cakewalk software features 256 tracks of unlimited length, a context-sensitive, on-line help system, and easy pull-down menu interface, a detailed Event View for editing MIDI parameters, and extensive global editing commands. Edit regions can be marked during playback and refined using Event Filter criteria. Cakewalk runs with an IBM compatible with at least 256K, a Roland MPU-104, and at least one MIDI instrument. $150.00. Twelve Tone Systems, Box 226, Watertown, MA 02272." One thing that I did notice was missing, both from this second ad and from these magazine product write-ups, is Twelve Tone Systems' buzzwords that was so boldly... er... bolded in their first ad: "Aural Editing". They used it to describe how editing regions could be marked by ear during playback. Well, it looks like they decided to drop the term already (but not the feature). Such is the life of buzzwords. Boooooo! As for the second advertisement itself, Twelve Tone Systems decided to enlarge the ad space from 1/6-page to 1/4-page, and this was a good decision on their part. Most particularly because it allowed the fun, laid-back personality of the company to shine through. "This hot sequencing software gives you lots of power for not much coin." "You are guided through all this power by a nifty user-interface..."
"Or dip into over 100 pages of the clearest documentation you've ever not had to read." "Cakewalk is all yours for just $150. Of course, if paying $500 for Cakewalk will make you feel better, we'll play along." That's just good branding. I'm reading it 30 years later and it still sounds like Cakewalk to me. There is one thing I'm still missing. Although the company has now defined their personality, they are still in desperate need of a logo. But they do have everyone's attention... and so its time for the next step. Which I'll get to in the next blog post. Update: The third blog post is now live! 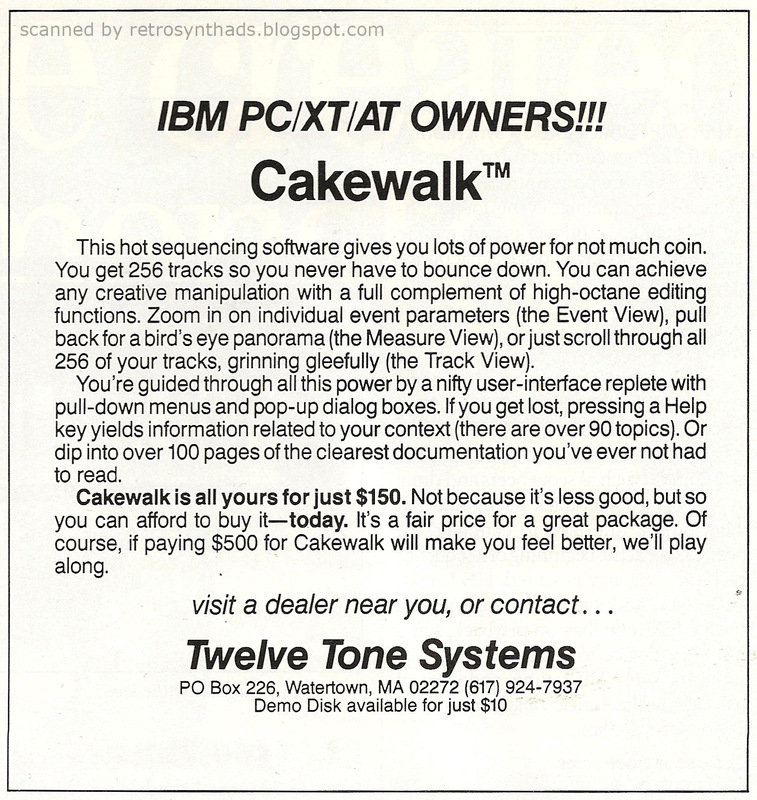 Twelve Tone Systems' Cakewalk sequencer "IBM Owners!!!" 1/6-page black and white advertisement from the top-right corner of page 57 the April 1987 issue of Electronic Musician. Before I begin - full disclosure: I've been a Cakewalk user for a *long* time. Not since the beginning (my first sequencer was Master Tracks Pro for the Apple IIe), but my bestie began with Cakewalk for DOS and so I had witnessed it in action in some of its earliest incarnations. Update: Cakewalk's second ad has been posted! And now the third ad! Its hard to believe Cakewalk has been around for 30 years. And even harder to believe that the end may be near as Gibson announced on November 17, 2017 that it was "ceasing active development and production of Cakewalk branded products". There's a lot of rumor and speculation surrounding this announcement, but I'm not gonna get into that here. What I wanted to do was take a little walk down memory lane and revisit some of Cakewalk's early days through a few blog posts. So, yup - this won't be the last you'll hear about Cakewalk. Anyways, back to this ad in particular - because it doesn't get much earlier than this - what is probably one of the earliest, if not THE EARLIEST, advertisement for Cakewalk. According to Wikipedia, the first version of Cakewalk appeared in 1987. To track down early ads I first looked through latter half of 1986 and the first half of 1987 issues of Keyboard Magazine. But couldn't find a thing. I then set my sights on roughly the same time period of Electronic Musician and sure enough found what I believe to be Cakewalk's very first advertisement in the April 1987 issue. The ad looks to have ran for three three consecutive months until June 1987. Most new companies don't have a lot of advertising dollars to spend, so it kinda makes sense that if a start-up like Twelve Tone Systems had to choose between Keyboard and Electronic Musician, they would go with the magazine more focused on software. The ad itself isn't much to look at - its only 1/6th of a page in size. But it says enough to peak the interest of any musician reading the mag that happened to have a Microsoft DOS machine around at the time. 256 tracks with global and event view editing was impressive software at the time. And almost as importantly, they included context-sensitive help for the many musicians that were just starting down that computer sequencer journey. One other interesting piece of info from the ad that jumped out at me was: "Unique Aural Editing(TM) lets your ears get involved". After some brief research, I learned that what that was referring to was how edit regions could be marked by ear (I guess while the sequencer is running?) and then further refined using event filtering. I enjoy companies that come up with interesting buzzwords for things. And of course, most importantly - we got the price! $150.00! That's about $325 in today's dollars. Not too shabby. Some really good early history of Cakewalk is available in a 2007 CDM interview with Cakewalk founder Greg Hendershott by Peter Kirn. The interview marked the 20th anniversary for Cakewalk, and Peter Kirn was obviously a fan. The interview gives us plenty of history on Cakewalk, parts of which I believe reference this advertisement in particular. According to the article, Greg had written the initial program and made the decision to place a small ad to see if he could sell a few copies to other people. "So I kind of procrastinated, and thought maybe I could try taking out a small ad and selling a few copies. And I did, and amazingly four or five people saw the ad and called up and ordered. And that was enough to pay for the ad and do another one." In regards to the name Cakewalk, Greg ended up choosing a word that was simple to spell and suggested ease of use. "Right before I placed the ad, literally two days before the deadline, I had picked another name for the program, and I found out it had been used by other software. I think it was something like Opus. So I had this little dictionary of music terms, and I saw Cakewalk." So dig finding advertising references like that. Great stuff. The interview is filled with tons of great Cakewalk history - how he came about the name Twelve Tone Systems, why the company name was changed to Cakewalk, thoughts on early DOS sequencer competitors like Voyetra, and Greg's philosophy on making his software affordable and free of copy-protection. If you are a Cakewalk junkie and electronic music history buff... go read it. Now! Update: Cakewalk's second ad has been posted! The saga continues! Moog Song Producer 1/6-page black and white advertisement from page 108 in the November 1985 issue of Keyboard Magazine. "Pivot" - you hear that word a lot now'er days. For example, Your FarmVille-app wanna-be isn't panning out? Pivot to become an online Organic Farm location service. 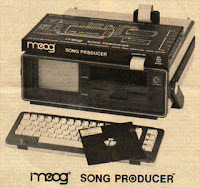 In the case of Moog Music, it looks like one such pivot started around 1983 when the company was sold to management. But in order to see it more clearly, we need to back up a bit. "Hidden away up in a hotel suite was a prototype of the SL-8, an eight-voice synthesizer that generates its colors digitally. The keyboard can be split and layered. Projected list price was somewhere in the neighbourhood of $2,495.00. No final plans have been made as to when it will come out." Without getting too far off my original point, I kinda went down a rabbit hole looking for info on the SL-8 and came upon a great little story. "The story goes, Moog brought this to NAMM 83 as an 8 voice polyphonic synth, a follow up to the Memory Moog (which btw has the fattest Osc's I might have ever heard). They brought the cards for the SL8 to NAMM in a "cardboard box" and this was placed below the SL8 for performance during NAMM. After NAMM the cardboard box containing the cards was lost or misplaced and all the remains is the body." Another reader followed up with some information from "a friend" about this SL-8 prototype appearing later on at a London trade show in 1984, including how the synth got it's name and why it may not have made it into production. "I'm very familiar with the SL-8, I was the person who got it working in London at the Music trade show in 1984. The boards were in a card cage underneath the prototype behind a curtain with big ribbon cables running up inside to the control panels. When it arrived in London from Buffalo it was DOA. I took the ferry over from our service center in Rotterdam to the UK and fixed it on the opening morning of the show. We took over 700 orders for it that weekend ($1995 Retail). When I got back to the plant, Marge Beltz (Our accounting genius) killed it. Ray Dennison and I are old friends and he ended up leaving Moog over that decision after spending a year of his life designing it. It was the first polyphonic Moog with a 16 bit Micro. The name comes from Split/Layered 8 Voice synth (SL-8). It had really gritty digitally controlled analog oscillators with a harmonic multiplier knob. " But anyways, back to the point... what was the point again...? It looks to be around the time of the buyout - and a name change from Moog Music to Moog Electronics - that the company began its pivot. For example, according to the Moog Archives web site, Moog had begun to put a new emphasis on contract manufacturing, such as in the production of the SSK Concertmate synthesizer for Tandy Corp (Radio Shack). And the company also began producing non-music related products, like the Telesys 3, later know as the Operator (view the advertisement on the Moog Archives site), and the Phone Controller (photos from the awesome MATRIXSYNTH). Hence why they couldn't keep on using the word "Music" in their company name, I'd guess. But that doesn't mean they weren't gonna keep a few eggs in their own Moog products basket. The company continued to sell the Memorymoog for a while, with advertisements running until the summer of 1984, and as we just read on Reddit, they were still showing off the SL-8 prototype into 1984. And there was one other musical product that seemed to survive the pivot - The Moog Song Producer hardware and software set-up for the Commodore 64. Now, I'm a big fan of the C-64 and hang out in the Facebook groups devoted to the computer. So, I can tell you that when someone posts *this* photo (see right) of the Moog Song Producer, a lot of discussion ensues. 5 (thank you again, MATRIXSYNTH). Most MIDI cartridges for the C-64 look and act very similar. They all have MIDI in and and out or two, and a few will get a little bit more exciting with a clock and/or tape sync in/out. A few like the Sequential Circuits Model 64 and C-Lab Supertrack-ROM will even have the sequencing software on the cartridge to save you from having to load a program on from a floppy drive. BUT, the Moog Song Producer was a different beast altogether. It was a large rectangular box almost as wide as a C-64 itself. And, as this ad will tell you, it included *a lot* more than just a MIDI in and one or two MIDI outs. - 4 MIDI OUTS channelize OMNI synths and speed throughput. - 8 gate outputs drive non-MIDI drums. - Footswitch inputs free your hands. - Clock IN/OUT and clock Disable IN/OUT provided for non-MIDI clock(s) control. - MIDI COMMAND splits/layers/transposes and controls MIDI PROGREAM Numbers for 4 instruments independently. - SONGSTEPPER composition program displays realtime entry and stepmode. Keyboard skills not required. Compose drums and music using one system. - SYNC COMMAND has 9 synchronous clocks with Master Tempo to get your gear together. - Dr. T's Music software now available for the Song Producer interface. Best of all, we also get some retail prices! $395 U.S. for the software and hardware. And $15 for the 250 page manual owners manual that includes 12 color photos of the software screens. Now, I'm not a big fan of paying for an owners manual, but this one was 250 pages, and it was written by Tom Rhea. So, I'll let that go. The ad itself isn't much to look at - but after doing some digging I found there's a lot more to say about Moog's Song Producer. But I've rambled on enough. So I'm gonna save that for the next Song Producer advert blog post.